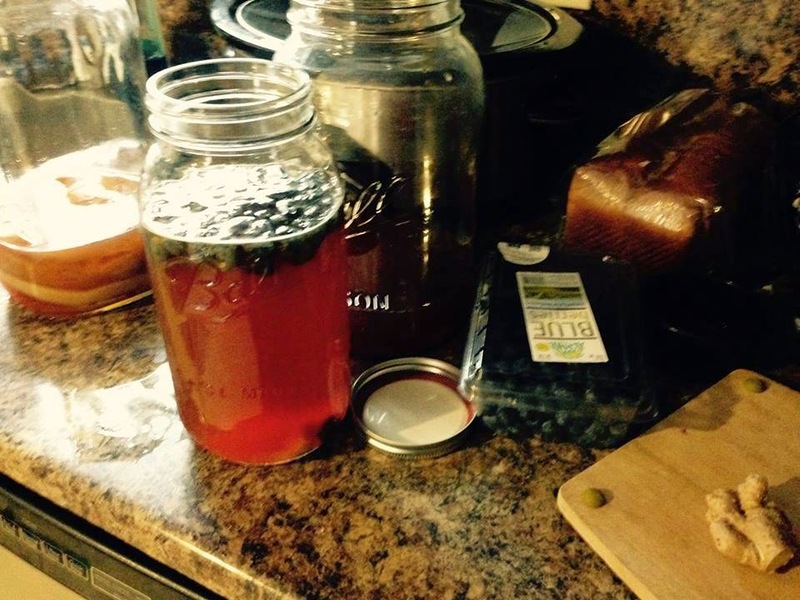 I've been making Kombucha for quite a while now and I have developed some of my own recipes using fresh fruit for flavor that I would like to share with you. But first, before you can flavor your kombucha, you have to have some kombucha to flavor, so here's the recipe I use for basic kombucha. Remove the paper tags from eight tea bags and place them in the bottom of a very clean gallon jar. Then pour in one cup of sugar and add approximately four quarts of very hot water carefully. 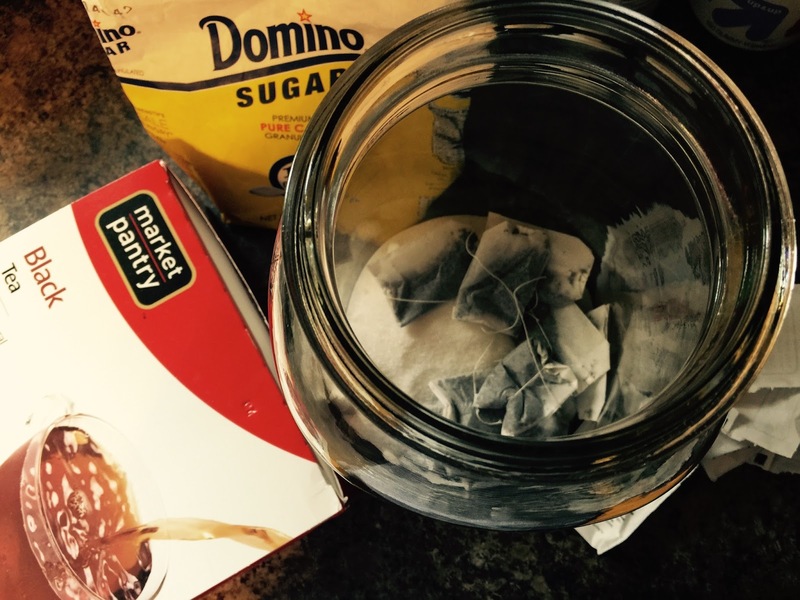 Sometimes I use organic teas and sugars, but just as often I use the cheapest ingredients like Market Pantry Black Tea and Domino Sugar. Let the tea brew until it cools to room temperature. Then with very clean hands, pull out the tea bags, add a live scoby and approx. two cups of finished kombucha or vinegar. Note: At times, I have used less than two cups of finished Kombucha to brew a new batch because I didn't save two cups worth of finished Kombucha. It's okay to use a little less. It just takes longer. 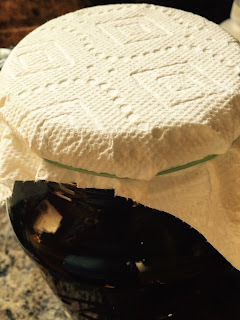 Finally, cover the jar with a coffee filter or paper towel and a rubber band and set the jar in a warm place away from sunlight where it will not be disturbed. I use a shelf in my kitchen closet or the corner of my kitchen counter. I leave it alone for at least a week. I only periodically look through the glass to see how the new scoby is growing on top of the tea. 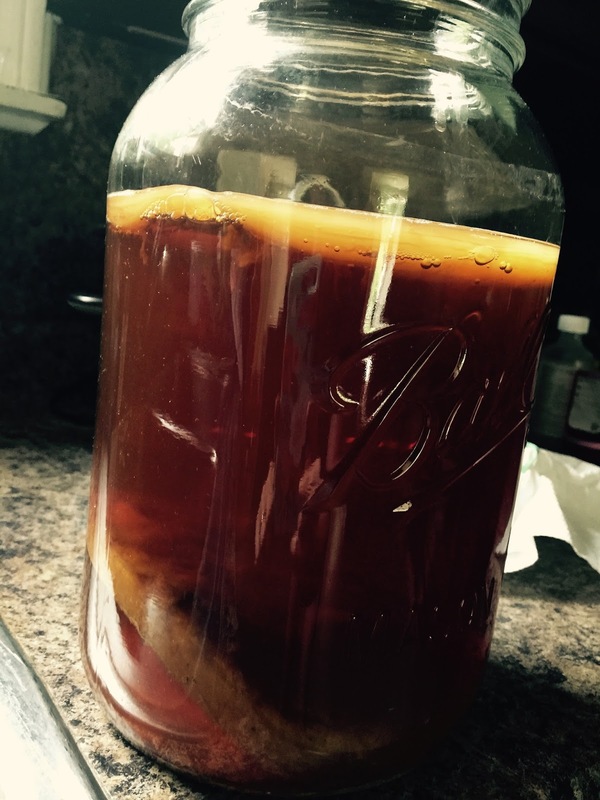 Once there is a new scoby on top of the tea that isn't transparent, your tea is probably ready to drink. To be safe, you can always use a ph strip to check. 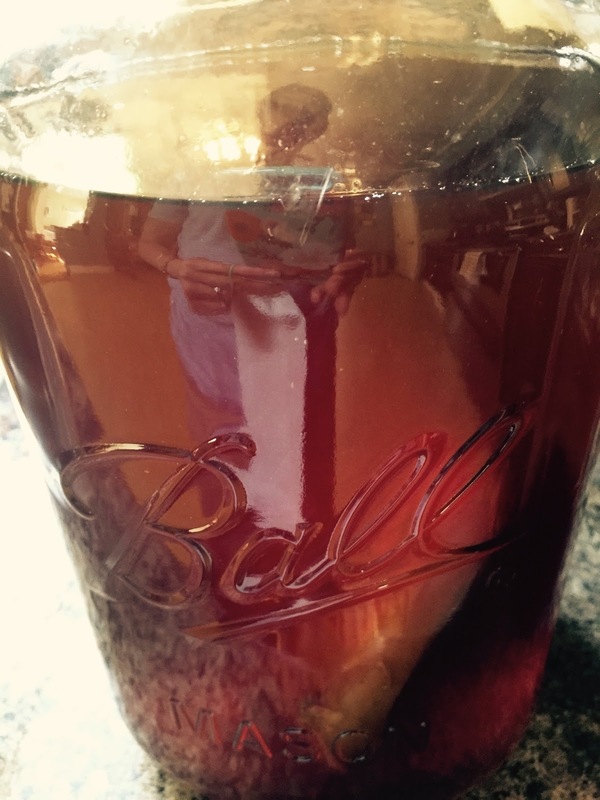 The thinner your scoby, the sweeter your finished Kombucha will be to your taste buds. But I often wait two weeks or more until my new scoby is about half an inch thick like the one above. I don't mind it when my Kombucha is sour, because I usually add fruit and ferment it a second time and that adds sweetness. And the longer you wait, the more of the good bacteria will be in your finished Kombucha. Once you have enough of basic, finished kombucha, you can drink it, making sure to save enough to start another batch, or you can flavor it with fresh fruit and let it ferment a second time so it will be bubbly because of the carbon dioxide that the bacteria produces. Here's how that process works. I usually use a half gallon jar, but you can use whatever size jar(s) you have. Fill a jar 3/4 of the way full with finished kombucha tea. Next, with clean hands and even cleaner fruit, I take fresh blueberries, tear them in half and drop the pieces into the tea. They will float to the surface. Once the top of the tea is covered with a layer of floating blueberries, cut and add a half inch cube of fresh ginger or one or two pieces of crystalized ginger if you don't have fresh ginger. The ginger usually sinks to the bottom of the jar. Next, I put a tight, clean lid on the jar and set it somewhere that it won't be disturbed. After approximately two full days, take the lid off carefully. A decent amount of carbon dioxide builds up inside the jar, so there can be a lot of pressure. It is similar to opening a two liter of soda. Once the jar is open, remove the scoby that has formed around the blueberries floating at the top of the jar. Any new scoby and used fruit just go down the garbage disposal. Next strain the tea into another clean jar to remove the other blueberries and the strands of yeast that grow in the tea. 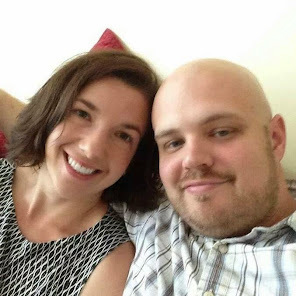 The strands of yeast won't hurt you, but they are quite unpleasant in your mouth. Finally, the flavored tea can be placed in your refrigerator with a tight lid until you are ready to drink it. Another favorite flavor in my house is strawberry. The process for strawberry flavored kombucha is very similar to the process for blueberry/ ginger above. 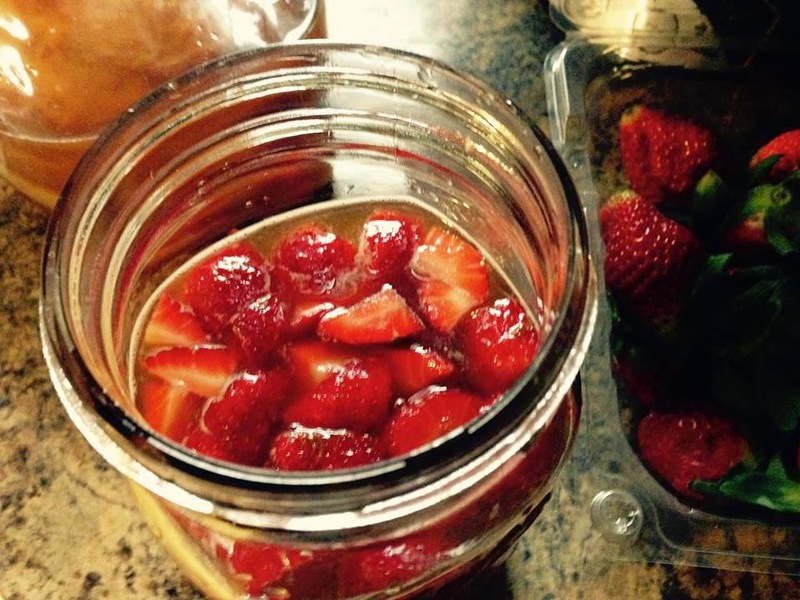 You simply fill a jar 3/4 of the way full of finished kombucha and then add clean, fresh, chopped strawberry pieces to the tea. The pieces will usually float on the surface of the tea. Add enough strawberry pieces to cover the top of whatever size jar of tea you are using and in my experience, that will add enough flavor. 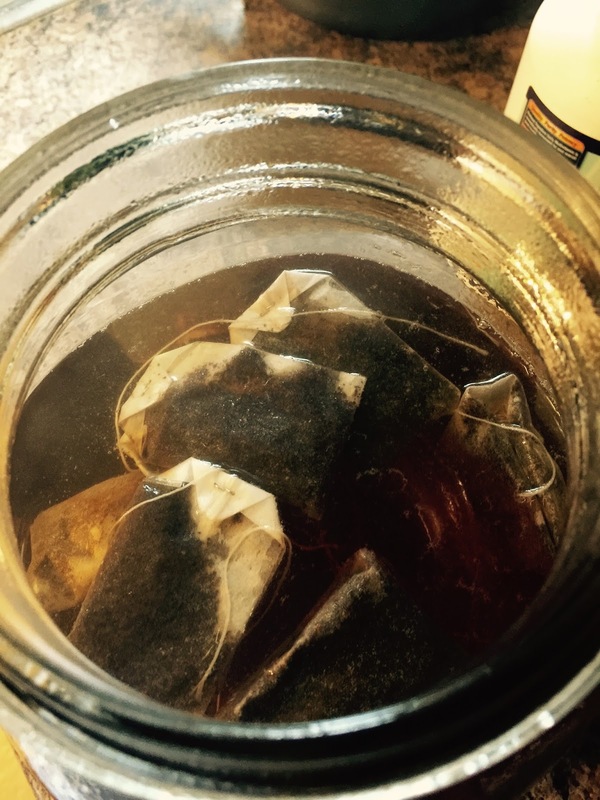 Put a tight lid on the jar, set it aside for two full days, sometimes three, if you don't have time to get to it, and then open the lid carefully because of the carbon dioxide gas that will have built up inside the jar. Next, remove the scoby that will have formed around the strawberries at the top of the jar and strain the rest of the fruit from the tea. Put the strained tea back into a jar with a tight lid and place it in the fridge unless you and your kids are like me and mine and are ready to drink it right away.